Sailor Bingo - 550% Cash Match Bonus over First 3 Deposits! Ahoy there, Boku Mobile Bingo Sites have taken to the high seas to bring you this next site. We have manned the sails and hoisted the yardarms just so we can have a little time with Sailor Bingo and see what he has to offer. As it happens there is a lot to look at, so we had better get started before the captain throws us in the brig. New shipmates aboard Sailor Bingo are treated to some great maritime favourites, such as treasure troves and loot. But, if you aren’t too sure what that means, check out the descriptions below. 1st deposit cash match – When you make your first deposit you will be granted a 300% cash match up to £120. Make a deposit of £40 for instance and you would receive £120 as a bonus, making a total of £160 to play with. 2nd deposit cash match – With your second deposit you can enjoy a 150% cash match up to £60. By depositing £30 you would receive £45 as a bonus giving you a total of £75 to play with. 3rd deposit cash match – Upon your third deposit you’ll find a 100% cash match up to £50. So, by depositing £40 you would receive £40 as a bonus giving you a total of £80 to play with. Newbie Bingo Room – Once you have opened your account, you will be given access to the newbie bingo room for just 7 days. This means however, that every day you can log in to this special room and claim 12 tickets for every game being played. That is an awful lot of bingo for just opening up an account so don’t waste it. This site is so amazing that it even offers you the ability to use your mobile or tablet, to access your account! If you have a device that is running on Windows, Android, Apple or Blackberry then Sailor Bingo is the one for you. Key the address into your browser and it is all systems go. At Sailor bingo you will find not only lots of great bingo rooms, but slots, casino and scratch card games. In the bingo rooms you will find a range of games running with 90, 80, 75 or 30 ball options. It’s up to you to decide which game is for you. But, with a variety of jackpots on offer and tickets starting from just 1p there is a lot of choice. You could try your luck in the Victoria 90 or even the Big Ben rooms. Take a tip from us, the slot machines at Sailor Bingo are the place to be. With games that range in theme from movies, music and your more traditional slot themes, you are spoilt for choice. Play games such as Mega Moolah or the retro Atari Asteroids. But, if you prefer more popular games you can always choose from the likes of Emoji Planet, Starburst or even Fireworks Frenzy. Stepping into the thrill of the Vegas casino is something everyone thinks of at some point. Here at Sailor Bingo you can get the excitement of Vegas from the comfort of home. You could try your hand at games like American Roulette, Keno and Deuces Wild. For you quick play bingo lovers there is even a casino style bingo game too. Rio Bingo is a fast-paced firecracker game that we think you will love. If you like playing scratch cards then you will love what is available at Sailor Bingo. Play online scratch cards like Cash Cuisine and our favourite Alchemist, as well as player favourites like Dragon Scrolls and Lucky Fish. Not only does Sailor Bingo welcome its new players with amazing deals, but regular players are well looked after too. With a range of promotions including penny bingo, prize draws and even BOGOF offers amongst others. These promotions are subject to change, so always check back regularly to see what is currently available to you. We have set out the permanent regular offers for you below. Golden Ticket – Every time you deposit £10 in a week you will receive a golden ticket. You can claim a maximum of 50 tickets per week. Every Friday your tickets gain you entry into the special golden ticket bingo room, where you can play for a share of the golden prize pot. Fortune Wheel – Deposit £10 within a 7-day period and you will be allocated a spin of the fortune wheel. You will get access to the fortune wheel once a day for seven days, from the day you deposit £10. Winnings from the wheel can range from bonus bucks or bingo tickets. 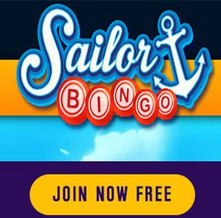 Refer a Friend – If you love Sailor Bingo as much as we think you will then share that love with your friends. When they register an account and deposit, you will receive a bonus by way of thanks and they will get access to all the amazing offers that are available. Bonus Bucks – You win bonus bucks by taking part in the chat room games and winning them. These are played whilst regular bingo is in play, so it’s a way of making it a little more fun for you. They are also awarded as part of special promotions, so watch out for those dropping into your inbox as well. As if all the offers and games aren’t enough to win you over, Sailor Bingo bring out the big guns. Yes, that’s right the loyalty scheme has landed. No need to apply to become a member either, as you are automatically enrolled into the scheme as soon as you register. Once you begin to wager real cash on games, you will start to earn loyalty points. So, all you need to do is play games, wager £2 on bingo or £10 on slots and you will earn a loyalty point each time you do. Your points can then be traded for bonus bucks once you have accumulated enough. Sailor Bingo likes to run a tight ship, so in order to ensure there is are no men overboard they have a great support team running things. If there is an account problem or you just want to shout out about your latest win, then you can use any of the following options. Live chat and telephone contact are available 24/7, so if your needs are more urgent use these avenues. Also available 24/7 are the email and ticket raise options, however you will only get a response through these avenues within the hour. Choose your method of contact wisely and know you are in great hands. Rather than trying to pay in gold doubloons (not the going rate these days), why not log in and use one of Sailor Bingos accepted payment methods. They will be much easier for you to use when you are out and about. Choose from debit or credit card, Skrill, Neteller, Paysafe Card, PayPal and the favourite of mobile users Boku mobile billing. With our heads full of sea shanties and our hearts full of love for the amazing things on offer at Sailor Bingo, we bid you farewell. We hope you have a wonderful journey on board the great casino ship of the online sea. All that is left for you to do is to get yourself and your shipmates registered, to grab those amazing welcome bonuses and newbie room access.